Recently at the end of a particularly hard class workout, a visiting student from England approached me and asked about the meaning of the first preparatory move in kata. The move is signaled by the 'yoi' (the command often used in Japanese karate to signal getting ready to do a kata) and can be quite subtle or large depending on the style and system. I had heard the same question many times before. It is a difficult question since kata don't come with instructions, and there are different interpretations, especially between the Chinese systems, Okinawan and even Japanese kata, styles and systems. Also kata are what you make of them, and an awareness of what you are practicing is important. There is also some evidence that in Okinawa, the birthplace of karate, that kata before the modern era often did not begin with a preparatory "yoi" move or with the same standard ready posture. Teachers such as Chojun Miyagai (founder of Goju Ryu) are said to have standardized kata beginnings with these additions. Thus, at the very least these movements identify, mark or symbolize the system or style within which the kata are practiced. But I think there is much more. In Goju ryu and some other styles of karate, the hands meet in the middle, one hand over the other. The heels of the feet are together with the toes pointing outward (musubi dachi). In Goju Ryu kata there is more emphasis on the mental aspect of preparation. A command "mokuso" is used to signal students to close their eyes and calm their mind without thoughts before the "yoi" is voiced. In other styles, an open palm of one hand covers the fist of the other. In Shotokan and in some katas of Seido, Kyokushin, Oyama karate and others the arms are often held apart, down and in front and (parallel) outside of the legs which are in a natural stance, the toes slightly flared (fudo dachi). It is here that the mind is focused and controlled (although there is no "mokuso" command, as voiced in Goju Ryu, expressly voiced for that purpose). When the command "yoi" is heard (or, when the kata is done alone, when a silent beginning is internally voiced) the arms move in some characteristic action -- as small as a drawback to the sides of the legs or as large as bringing the arms up, both hands starting at opposite ears, followed with a lowering of them to the sides. Although more pronounced in some systems, the preparatory movement includes a forced out breath (ibuki breathing), the hips tucked forward under the body trunk along with body tensing followed by relaxation (still slightly tensed ready to go into action) as well as foot/leg rotation outward under tension (having first been turned in). All this may be subtle or very overt, but nevertheless evident in most karate. In the few Chinese styles I have studied the initial move seems much more perfunctory, and is given less emphasis than in karate, especially Japanese karate. So what is happening? First we should realize that kata is a lot more than just technique. Kata are performed on other levels too, including the strategic, psychological, spiritual and physical (body). Here, I think, what we are seeing is these other levels, and a lot is going on at once -- things most people never pay attention to. Imagine this scenario. You are walking alone down a street, path or sidewalk. It's night and it's deserted. Suddenly you are aware of several men approaching. They are young, with black jackets and one has a headband. They look drunk. Your mental alarm goes off and you feel the hair on the back of your neck stand up. You ask yourself, should I run, or is it really something innocent? Maybe I am mistaken. But then they are around you, pushing your chest, one man demanding that you hand over your wallet. You feel sick, cold sweat on your forehead. Fear is now tangible. The mind shouts, 'do something,' but you feel frozen, as your heart pounds, your breath racing. Even your vision seems to narrow, as if looking down some tunnel. This is not the dojo, this is not some self-defense practice -- you know your life is in danger. This is real, and fear and anxiety take control -- paralyzing your mind and forcing physiological reactions that limit your ability to respond. 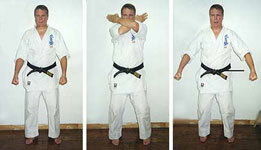 In some karate styles or schools, during class practice of kata, students begin with a 'rei," or bow to the teacher. This precedes the "yoi" called out by the instructor to signal to each student to get ready to engage in the kata's particular portrayal of a combat situation. The actual kata begins with the order to start (hajime), or with a count signaling students to perform the first move of a kata. While the yoi is not vocalized when kata is practiced alone or demonstrated outside a group class, the preparation is very much as real -- you are getting ready to perform kata, kata which is combat codified within sequences of movement. So, "yoi" can be best understood as the signal to begin self-preparation for combat -- preparation to face not only opponents but also the self -- the mental and psychological barriers noted above. And there is an element of strategy too. At the end of the preparatory movement, you are softly tense, like a calm tiger ready to move explosively if necessary, but still not taking the offensive. This is the THE REAL BEGINNING OF KATA. Let's look at what happens in the first preparatory move. You take a deep in breath and forcefully exhale (ibuki breathing). This can be pronounced or subtle. This takes care of the natural body reaction to intense stress -- hyperventilation. Your arms (and it doesn't matter the exact movement patterns) move to tighten and then slightly relax. So do your legs and torso. You have taken control of your body. Your eyes and mind focus on everything and nothing, repeating in microcosm the years of quiet meditation that allowed you to abstract the self from all emotions and thoughts -- but this time to relax the mind and maximize total awareness (zanshin), settling the self in the lower abdomen that is pressed forward (proper posture) to align the body and its energy pathways -- a center also recognized for its sixth sense or intuition. You are ready to move into action instantly or continue to be alert and ready after action. Others will recognize this position as the same one necessary to align the hips with the spine so as to provide efficient power (see the article, "A Simple Lesson in Body Mechanics"). There is an old samurai saying, "When the battle is over, tighten your chin strap" (of your helmet). Police officers have observed, for example, that immediately following an arrest, when an officer feels that danger is over, is actually the most dangerous time: the inclination to relax occurs at the same time the prisoner may be desperately searching for an opportunity to escape. This mental state can have profound effects. Have you ever been in an auto accident, and in the last second or fraction of a second seem to experience the world in slow motion as the accident played out across your mind? This is a Zen moment of total awareness, but unfortunately one imposed upon your mind by the intensity of the situation. Think, if you could control this feeling and see a confrontation unfold slowly while maintaining a mental state within which you could freely act without psychological reactions clawing against your every move. That is what Zen type meditation can give you. 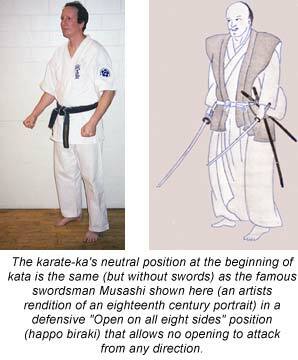 It is also something which can be practiced through kata. Kata can be viewed as planning for and execution of practiced reactions to stressful contingencies. The effectiveness of this preparation, however, can vary tremendously. If we just perform the "yoi" preparatory move, even thousands of times, in a normal mental state, little will be achieved. But if you self-prime your mental engine with fear, your "yoi" move, both physical and psychological, will have an actual state of high anxiety to play off against. How is this done? You might dredge up moments of intense fear experienced in the past, or try to create a vivid image to do the same. Then after much practice your preparatory move creates a psychological reaction -- the preparatory move being associated with control of mind, body and breath in the face of anxiety or fear. You create a conditioned response. Anytime anxiety strikes you can easily counter it, even at home or at the office -- your preparatory move in kata, even if performed in a very subtle manner, will still elicit those responses that the body had been programmed to follow. Accompanying this total awareness is spirit -- spirit that fills your every movement and position, that emanates from your eyes and stance. My teacher Kaicho Tadashi Nakamura often demonstrates the importance of spirit in kata. He notes that when you begin a kata you should evidence a powerful assertiveness, a confident, controlled movement and focused eyes that emit a powerful spirit and will embedded within your movement and stance (kamae). These same attributes were reflected by the feared and legendary Japanese swordsman Miayamato Musahi who said: "When I stand with my sword against a foe, I become utterly unconscious of the enemy before me or even of myself, in truth filled with the spirit of subjugating even earth and heaven." There are many stories from old Japan that tell of one Samurai recognizing the mastery of another just by the other's stance, the way he sits or rides a horse. Thus, just the way you stand at the beginning of the kata can reflect your assurance, spirit and quality of your technical mastery. Many years ago Richard Kim (a much respected karate historian, author and teacher) made this point to me. During one discussion, Richard held his two hands apart, pointing the index fingers of each hand. He said that rarely in karate do we ever experience the reality of life and death combat, something the Samurai of Japan once faced. "The one place their spirit can reach out to touch ours," he said as he touched the finger tips of his hands together, "is within kata." He noted that within kata we can experience and live the same danger, the same fear and threat of death that Samurai learned to deal with. And that should be the highest goal in kata too -- to reach out and touch the true Samurai spirit from across the centuries. Following the initial preparatory move the feet are parallel or slightly flared outward (depending on kata and style) and the hands are at the sides -- a natural stance. This neutral position, without commitment, contains both defense and strategy. It represents the common position many people find themselves in when suddenly attacked. To the defender's advantage is the stance (parallel or fudo dachi), which allows quick movement in all directions. To his disadvantage are the arms --down at his sides. The actual first move of kata beyond the preparatory movement, many argue, starts with a natural startle reflex movement of raising the arms for protection. Some argue that these movements can be interpreted as the beginning of various blocks or arm movements which, when completed, are seen as the first actual moves in the kata, such as the down or inside one arm block or two arm blocks. But if an attack isn't in progress or immediate the neutral stance also contains, etiquette, strategy as well as a psychological element. Gogen (The Cat) Yamaguchi (Japanese Goju Ryu) in his book, "Goju ryu Karate-do Kyohan," suggests that while the crossed hands in front protect the groin from sudden attack, that: at the same time "you show the opponent that you will not attack suddenly. This was the etiquette of the samurai. The samurai would take off a Katana (long sword) from their waist and change it to the right hand showing that their would not be a cowardly act such as slashing the opponent without notice." The neutral stance is also defensive since potential threat has not been reacted to by taking a fighting stance. There is an old Okinawan saying, "we need two hands to clap" (it takes two to quarrel). At this point any outward physical attack will automatically trigger the physical confrontation before the psychological cards have been fully played. But if an attack has not begun, there remains a physiological card which might avoid conflict altogether. Appearing not to react, rather than assuming a defensive stance or showing fear or intimidation, can be very disconcerting to a potential aggressor. Remember, aggressors are fearful too. They depend on your fear and your intimidation. So, a lone aggressor, or several, try to intimidate you to see how you react. If you don't react on the surface, this is unnerving. Intimidation and outright fear was expected, at least some nervous expression, some act of mental reaction that would signify defeat, or at least some vain and weak attempt at defense. Instead you are standing there unafraid, almost detached but exuding a confidence and spirit. "Something is wrong," the attacker (or attackers) says to himself. "He's not reacting. He is not afraid. What does he know?" If you are able to do this before an attacker has physically started an assault, you have put him or them on the mental defensive. This can be very powerful. There is an old Japanese story of the Tea Master and the Ruffian that makes this point. The Lord of Toas Province in Japan, Lord Yamanouchi, was going to Edo (now Tokyo) on an official trip and insisted that his tea master accompany him. The tea master was reluctant. He was not a sophisticated city person and not a samurai. He was afraid of Edo and the dangers he might face, but he was unable to refuse his master's request. His master, however,in a conscious attempt to boaster the tea master's confidence, attired him in Samurai clothing with the customary two swords. The Lord thought that among the other samurai on the trip, the tea master would become invisible. One day after arriving in Edo the tea master decided to take a walk. The very danger he feared most then confronted him. A ronin, a masterless samurai, approached him, insisting that it would be an honor to try out his skills in swordsmanship against a samurai of the Tosa province. In reality all the ronin really wanted was the tea master's money which he could get if he killed him. The shock of this confrontation at first immobilized the tea master. He couldn't even speak. Finally gaining a little composure, the tea master explained that he was not really a samurai, and didn't want a confrontation -- that he was only a master of tea dressed this way by his master. But the ronin pressed harder. He demanded a test of skills. He said it would be an insult to the province of Tosa if its honor wasn't defended. The tea master didn't know what to do. After thinking it over for a while he saw no way out of the situation. He became resigned to dying. But then he remembered he had earlier passed a school of swordsmanship. The tea master said to the ronin, "If you insist, we will test our skills, but first I must finish an errand for my master and will return later when the errand is completed." The ronin, now pumped up with confidence, readily agreed. The tea master made his way back to the school of swordsmanship. Luckily, the master was in and would see him. The tea master explained his situation and asked the sword master how he might behave correctly, to die like a samurai, so as to behold his province's honor. The swordmaster was surprised. He answered that most come to learn how to hold and use a sword,whereas he had come instead to learn how to die. "Serve me a cup of tea," said the sword teacher, "while I will think the situation over." The tea master cleared his mind. He knew this might be the last cup of tea he might ever serve. He began his preparation, a practice ritual performed as if nothing else existed, each movement being a total concentration on the moment, on the action. Impressed with this performance, the sword master said, "that's it." "Tomorrow," said the swordmaster, "when you face the ronin, use this same state of mind. Think of serving tea to a guest. Apologize for the delay. And when you take off your outer garment, fold it and place your fan upon it with the same calm assurances and grace that you use in preparation of tea. Continue this focus as you rise and put on your head band. Draw your sword slowly, raise it above your head and hold it there, like this," he said, "and close your eyes. When you hear a yell, strike down. It will probably end in mutual slaying." After thanking the sword teacher the tea master returned to meet the ronin, resigned to his fate. Following his advice, the tea master apologized for the delay and began to prepare himself ceremoniously -- carefully taking off his outer garment, folding it, and then placing his fan on top. The ronin was startled. This fearful figure, who once said he was but a lowly tea master, had changed. Now before him was total concentration, poise and confidence -- someone fearless and controlled. The tea master finally faced his foe and raised his sword as he had been shown. He closed eyes awaiting the shout that would seal his fate. But nothing happened. Seconds later when he finally opened his eyes, there was no ronin to be seen, only a small figure is the distance quickly receding away.